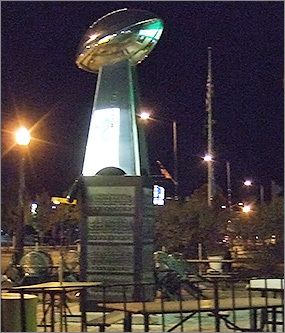 Established in 1992, Stadium View Sports Bar & Grill is centrally located in the heart of the Entertainment District. It's know for having a unique atmosphere, great customer service and excellent food. It's also known for specializing in large parties or events. The 'View' was a regular stop for their well seasoned piping hot Sunday Chicken Special. Something happened here because the chicken is now bland and lacking in seasoning. I kept going back thinking it was just a bad night. 4-5 times consecutively I've left disappointed. I can't help but think that their regular crowd has noticed the change and business has fallen off. Last week we ate lunch at Stadium view and enjoyed a wonderful perch plate. The portion was large enough for 2 adults to share. The clam chowder was fantastic and the cheese curds are the best in town. The kids ordered a 16 inch pepperoni pizza and didn’t come close to finishing it because it was so big. We ended up bringing most of it home and they polished it off an hour later. If you’re looking for great food in a fun atmosphere, head to Stadium view. Since the Packers will be playing in the Super Bowl Sunday (Go Pack Go! 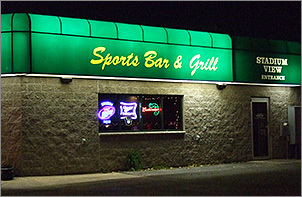 ), I was in the mood to eat at a sports bar and grill that is close to Lambeau Field. I went to the Stadium View which is located in Ashwaubenon area on the west side of Green Bay. 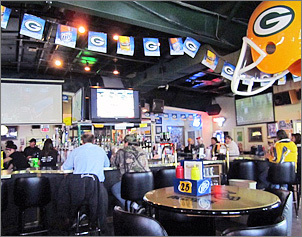 The interior of the bar and grill is one large room with very high ceilings and there is a giant plastic Packers helmet hanging up high in the middle. The bar is located in the center of the room and towards the back is a pool table with arcade games and with large flat screen TVs throughout. 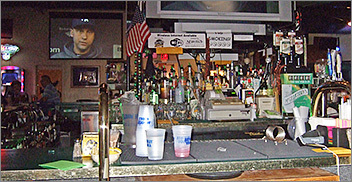 There are no booths just a lot of tables surrounding the bar and on all the high top tables there are large pictures of the Packer helmets. The atmosphere is extremely casual, lively, and upbeat. Even though there are large windows in front of the restaurant the lighting is dim. The Stadium View has a large menu and one of the specials that day was a half broasted chicken for $5.15. It included a dinner roll and you have a choice of salad or french fries, I chose the salad. My server was friendly and brought out a glass of ice water which was served in a thin plastic to go cup with a straw. As I was waiting for my meal a different server tried to serve me a hamburger which was meant for the person next to me. After about a good thirty minutes my chicken dinner was brought to out; it was served on a paper liner in a plastic basket, with my salad on the side. My salad consisted of pale romaine lettuce, tiny croutons, two cucumber slices, and two grape tomatoes and my dressing came in a plastic to go packet. 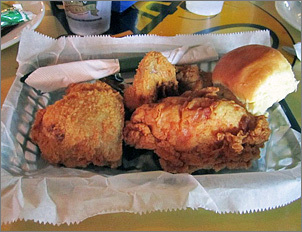 My broasted chicken contained one medium breast, one small drumstick, one small thigh and one wing with a small white dinner roll and a pat of butter. The chicken tasted good and was heavily seasoned, but it was also a little overcooked. During the meal the server refilled my water and cleared the table soon after I was finished eating but it took an unusually long time to get my bill. Stadium View is a fun place to have a few drinks and sit and cheer on with the Packer fans. Are you ready for this Sunday? I know the Packers sure are. It's the Packers against some purple team with a quarterback who likes to take pictures of himself from the waist down and send them to women who want nothing to do with him. Welcome home, Brett Favre! The Packers are waiting for you. Do you know who else is ready for this Sunday? Stadium View, that's who. Stadium View is a hop, skip and a jump away from Lambeau Field. Big deal, you say? Let's see... They also offer a $25 all you can eat and drink 2.5 hours before the game. You can eat a lot of burgers in that amount of time when you're washing it down with free tap beer. Now that I have your attention, let me continue. Stadium View has the game (or any Wisconsin game) showing on these gigantic movie screens and all their regular large flat screen TV's. The actual bar part is located in the middle of the room so you have 360 degrees of sports madness at all times. Plus, there are drink specials always going on for Packer games, Badger games, Gambler games, you get the picture. And, AND for all the Packer games they have bands come and play some tunes for you. Yes, you, just for you. Even without all the hoopla that this bar provides for you on sport days, this place is still fun. They have darts, arcade games, pool and a live basketball machine game. Which, by the way, I'm not too shabby at. The bartenders are really nice and everyone there seems in good spirits. The atmosphere is ultra relaxed, and Stadium View makes sit easy for you to sit back and take a breath. On draught they have more than a few choices: Miller Light, Bud, Bud Light, Leinie's Red, Leinie's Honey and Spotted Cow. The have more Bud, Miller and Coors products in bottles and a full liquor bar. I also spotted with my lovely brown eyes a Jagermeister machine and those flavor Mcgillicuddy liquors in a tap machine as well. Yum. Packer Days or not, this bar has just what you're looking for.